Set in Mississippi during segregation, one college graduate aims to tell the painful story of how southern housemaids are treated in a society that deems their race far from equal. Dejure and defacto segregation are topics that are no stranger to cinema. A number of films have taken aim on Jim Crow laws and their impact upon southern society within the United States. 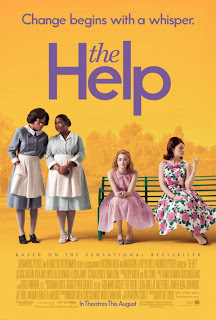 What sets "The Help" apart is not the blatant racism on display or the poignant illustration of the southern class structure but instead it is the unique perspective. A perspective that I had frankly never even fathomed before. Focusing on telling what it is like to raise another person's child only to have that child grow up to be just as racist as their birth parents. A cycle that happened in the south since the days of slavery. A cycle that had become generational and the norm among southern white middle to high class families. 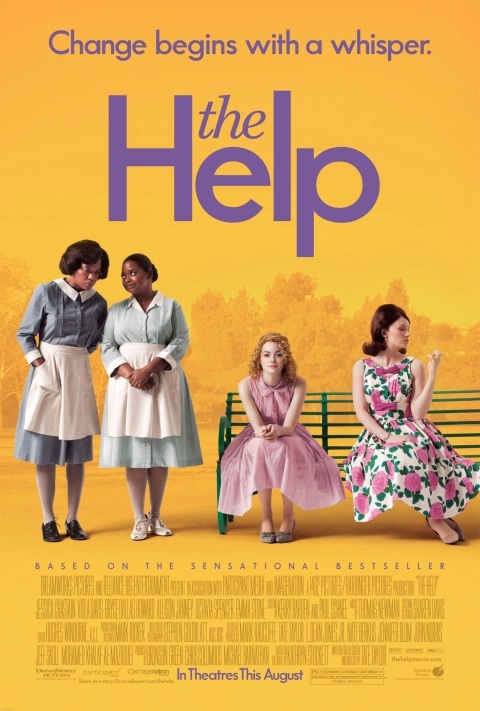 While the perspective "The Help" features is fresh, it doesn't outright carry the drama. What does, is a well developed script jammed engaging characters written and adapted by Tate Taylor. Too many films introduce supporting characters into a film only to leave their character underdeveloped, but Tate Taylor's script does exactly the opposite. Nearly everyone in the film is fleshed out with an arc central to the overall story. This movie has so many strong supporting characters it is hard to pinpoint who is the clear lead. Advertising tells us it is Skeeter (Emma Stone), a college graduate who pushes the women into telling their side of being maids in the south. While Skeeter's character is central to the story, I found her to be the catalyst to Aibileen's (Viola Davis) story. Aibileen comes across as the driving force in the film, especially the way her story is so elegantly bookended with her own narration. The entire cast of "The Help" is unblemished. Everyone deserves high praise, though one will most certainly earn herself some nominations. Viola Davis delivers an absolutely endearing and tear-jerking performance as Aibileen Clark. What we saw a small sampling of in 2008's Doubt is on display with tremendous precision here. Right behind her is Bryce Dallas Howard as the racially charged socialite, Hilly Holbrook. Howard is so good at portraying a conniving and holier than thou debutante, every time her character is on screen she would begin to make my skin crawl. It is has been a long time since I held such spite against a character from a movie and I applaud Bryce Dallas Howard for her portrayal. Allison Janney too deserves acclaim for her portrayal of Charlotte Phelan, a mother caught in between what is accepted by the southern society she lives in and her daughter's persistence to question those traditions. Octavia Spencer and Jessica Chastain are a massive part of what makes "The Help" such a well balanced emotional payoff. These two are the much needed comic relief to the film. They help to lighten the burden of a less than simple and emotionally heavy subject matter. Octavia Spencer plays Minny Jackson, Aibileen's best friend. Spencer has a polished sense of comedic timing and really uses her natural talents to elevate the character of Minny. Jessica Chastain plays Celia Foote, the town's outcast who befriends Minny. Celia is set up to be a dimwitted and simplistic character though Chastain shines through delivering a fetching performance. Emma Stone is innocent and unafraid as Eugenia 'Skeeter' Phelan. So many times we see central female characters who never make changes in period pieces. We use excuses to rationalize why these characters aren't more assured, but here, nearly every female is driven by some form of empowerment. Director Tate Taylor's film does peddle an inspiring message yet the numerous weighty performances help to rise above any underlining thoughts of the overt sympathetic tropes. While Stone's performance is energetic and compelling she is eclipsed by the rest of the capable cast. Two perfect examples of this are Sissy Spacek's portrayal of Missus Walters and Cicely Tyson as Constantine Jefferson. Spacek like Octavia Spencer and Jessica Chastain provides a number of comical moments while Cicely Tyson's performances hinges on something entirely different. Adapted from the bestselling novel of the same name, "The Help" is not based on a true story although it certainly details aspects of a long standing subculture inherent in south. In actuality, the novel started off as a way author Kathryn Stockett used to remember a maid/nanny she was co-raised by. What the book (and film) became however, is much more meaningful. It is a powerful snapshot of how bravery the of a few people can inspire change in many. The period drama is an emotional experience that balances rage, sorrow and gratification in a nearly-spotless fashion.